In October, the “Month of Respecting Senior Citizens,” the New Life Welfare Foundation held a consolatory party for senior citizens living alone with rigors and diseases. In October, the “Month of Respecting Senior Citizens,” the New Life Welfare Foundation held a consolatory party for senior citizens living alone with rigors and diseases on the 27th. 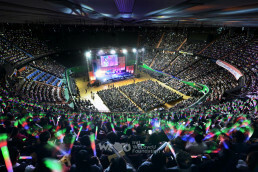 To this party 20 elderly women living in the Sangdaewon-dong, Seongnam-si, Gyeonggi-do, Korea, were also invited. 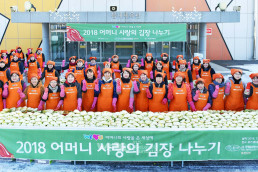 Around 11 a.m. at the welfare center of Sangdaewon-1dong, Seongnam city, while the party was being prepared, an instant song contest was unfolded, being presided by the humorous and witty member Kim Jae-hun. One elderly woman was so excited that she sang three songs in response to the encore request from the other elders, who danced to her tune with shoulder dance. 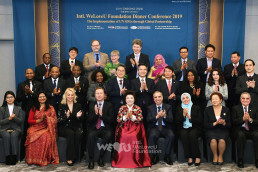 Senior citizens are delighted, following the humorous movement of the foundation member Kim Jae-hun. While they were singing and laughing, the foundation members set delicious food that they had prepared on the table: rice cake, assorted fruit, sweet drink made from fermented rice and so on. All the members, including Chairwoman Zahng Gil-jah, served the senior citizens by checking whether or not they needed anything else and by talking with them. After the meal, the members massaged the shoulders and arms of the senior citizens and shared friendly talks with them in whispers. One elder blushed at the pleasing remarks from the Chairwoman that she looked younger than her age. Not only she but also an blunt elder all brightly smiled at the pleasing remarks from the Chairwoman. Chairwoman Zahng Gil-jah helps the senior citizens eat, and the members massage them. Chairwoman delivered gifts to the senior citizens leaving for home, and said, “You have lived for the country and children, so I wish you to have warm winter with these little gifts from the foundation members.” The gifts were sesame oil, side dishes and towels, which contained the careful concern for the life and health of senior citizens. After the consolatory party, Chairwoman and the members personally visited the senior citizens who could not attend the party for their illness, and offered separately prepared foods and gifts including financial support for heating and medical expenses in winter. Most of them lived at the small rooms in the basement on the steep hill. The volunteer Lim Chun-su (47) who contacted the New Life Welfare Foundation through the voluntary service center and introduced the senior citizens said, “Many senior citizens are not able to get government subsidy just because they are registered to have children who are not reached any more. The senior citizen Park In-seok lives with her sick son, suffering from asthma himself. The senior citizen Song Bok-sun lives, relying on her mentally disabled daughter. The senior citizen Park Gi-sun who is paralytic with her arthritis said, “I overwinter without heater because of the increasing oil price.” Chairwoman visited these five elders whom she had been scheduled to and delivered the fund to them with encouragement. Then, she climbed the steep hill again, as the volunteer Lim Seong-chun said that there was another senior citizen who was living in a more difficult condition,. The volunteers who led Chairwoman and the members to the elderly women’s houses said, “I have never seen these magnificent foods ever since the welfare center was established.” They complimented the New Life Welfare Foundation members, “The beautiful ways you serves the senior citizens are like those of angels.” Not only the members but also the volunteers who were taking care of the senior citizens all the time were beautiful. Cold winter is coming. It’s time we are concerned with our neighbors in need and deliver our warmheartedness to them by helping them from small things.